The Omaha Police Officers Association is dealing with the backlash after posting on its site a video labeled "The Thug Cycle," featuring a black toddler in diapers swearing and giving encouraging adults the middle finger, the Raw Story reports. "We here at OmahaPOA.com viewed the video and we knew that despite the fact that it is sickening, heartbreaking footage, we have an obligation to share it to continue to educate the law abiding public about the terrible cycle of violence and thuggery that some young innocent children find themselves helplessly trapped in," the post introducing the video read. The association acknowledged that there was technically nothing illegal going on in the video but called it "flat out immoral and completely unhealthy" for the child. While most observers would consider the behavior displayed in the video to be inappropriate, Willie Hamilton, the executive director of Black Men United in Omaha, accused the association of singling out the child and jumping to conclusions based on a short clip. "The police actually have a website that is perpetuating mistrust and anger, and I think that is what it is meant to do," Hamilton told the Omaha World-Herald. "I thought posting the video was crossing the line. To use that incident to say that our kids are going to grow up and be thugs is far-reaching and insensitive. We are talking about a child that hasn't even gone to school yet. "If the police chief is trying to amend the broken relationship with our community, he needs to say, 'On my watch, I will not allow this kind of behavior,' " Hamilton added. "Maybe we should look at how much control the police union has. They shouldn't be able to use the website as a shield to post these nasty things." The president of the union, John Wells, told the World-Herald that the intent of the video was not to belittle anyone but instead to educate. "Unfortunately, there is no crime against raising your kids that way," Wells told the news site. "It is quite the snapshot into violent crime culture happening in Omaha." 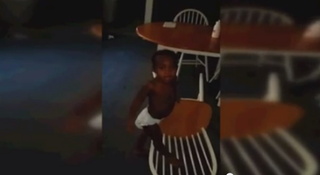 In the brief clip, adults in the background are heard cursing at the child, calling him various slurs and encouraging him to repeat them. At one point a voice can be heard asking the toddler, "What hood you from?" According to the Raw Story, KMTV reported that the police department has alerted Child Protective Services about the case. Read more at the Raw Story and Omaha World-Herald.